2019 MODEL!!! EXPEDITED 1-3 BUSINESS DAY SHIPPING!!! Hybrid Fitness Bike 28" Red Aluminum Frame Men Sport City Bicycle Shimano New! 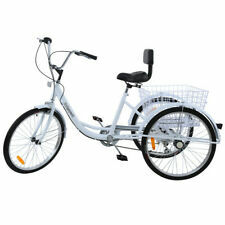 18 product ratings - Huffy Cruiser Bike 26" Women Beach City Commuter Bicycle Blue Rear Rack New! 2 product ratings - Mens Mountain Bike Bicycle 21 Speed Shimano Aluminum Full Suspension Black 26"
Vintage 1986 Bridgestone Mile 112 SE, excellent condition, not refurbished, 25"
This page was last updated: 22-Apr 17:56. Number of bids and bid amounts may be slightly out of date. See each listing for international shipping options and costs.